In a new initiative by Bristol Water, I am doing 10 Guided Days in the 2016 Chew Pike Trials. So if you are new to Chew Valley Lake's 1200 acres, not been successful in recent years or simply been unable to secure a boat for Europe's most popular piking days, then this is a great way to get yourself onto the water. Demand for the days, which only went on general release last week, has been high and only 7th Feb and 16th Feb remain available for the Spring Trials and 7th Nov for the Autumn Trials. To book one of the 3 remaining days please contact Woodford Lodge on 01275 332339 01275 332339. The cost per boat will be £300 and applies to 1 or 2 people, so is great value for money. I can supply all tackle if you are new to pike fishing. Last week I took Jeff Harris from Dallas, Texas for two days guided fishing. Day 1 we went to Litton lakes and he sampled some top quality rainbow and brown trout fishing, with every fish full finned and fighting fit! A floating Line and small gold head lures was the best tactic and by the looks of the trout, they had been eating well during these abnormally mild Winter months. Jeff's best rainbow weighed around 4lbs while his biggest Brown was well over 3lbs. All the fish were released and if anyone fancies a day out before the main reservoir season begins, just email me and it can be arranged. The next day I took Jeff to Avon Springs Fishery near Andover to fish the Wiltshire Avon. 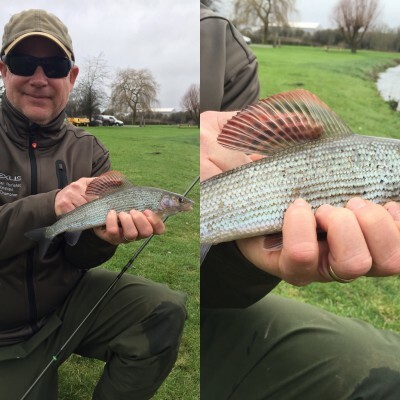 Jeff had never caught a grayling but we soon corrected that and by the end of the day he had plenty of grayling up to about 1lb but he also lost a brute of a fish which threw the hook in the fast water - we did see it though and it was easily 2lbs+. This is a great venue to learn some river skills and stays open all season long. With almost a mile of river plus the bonus of 2 lakes if the river is out of sorts, it is a perfect venue for a day's fishing or for a corporate day. Monday heralded the start of the 2015 fishing season on Chew Valley Lake, starting with the Spring Pike Trials. Already pike up to 39:06 have been caught so it looks like the "big girls" are certainly feeding! I am out for the first time tomorrow so we're hoping for light winds and slightly warmer weather - although I don't think that is likely. There has been a big spread of boats across Chew's 1200 acres and the bank anglers have also done very well. In fact, as I write this around midday on Wednesday, reports are just coming through that a 38:00 has recently been banked. I am out with Mike and Will Anderton from Keswick for the next two days, so I will update the Blog and FB with any fish that we catch. I am now taking bookings for the coming fly fishing season; both for trout and pike on the fly; Chew and Blagdon Lakes. Already my weekend dates have booked fast and although both Opening Days are booked, there are plenty of early season dates still available. Blagdon opens on Saturday 7th March while Chew opens a week later on Saturday 14th March 2015. The stock fish have fed well over the mild Winter months and are in tip-top condition for the start of the season. I am also hopeful that plenty of rainbows and browns will have overwintered this year due to thew mild weather and availability of food throughout. Some of my piking friends have reported follows from huge trout while lure fishing for pike, so things are looking very positive all round. The Chew Pike Trials began last Monday and are now into their 2nd 5-day session. At least one 30lb fish has been caught every day and sometimes two in a day! This is in addition to many big 20's and a host of doubles. Even the smaller fish; which many thought were not present last year, have made a welcome appearance, so all is well with the Chew pike population. The roach and perch shoals are absolutely immense and will provide food for the predatory fish and the overwintering trout. Sadly there are already over 200 cormorants on Chew Valley and this is not good news for these baitfish. My best fish last week weighed 31:08 and was part of an 11 fish haul to lures with John Synnuck, whose best fish was 21:08, while I managed another of 23:00. Yesterday I fished with Nigel Snell and his son Josh and we boated just the 3 fish - Nigel had a 6:00 pike then I had one of 23:00, before Nigel topped the day off nicely with a beauty at 27:08. Once again the fish took either Fox Replicant Lures or Silver Spoons. So far during these Pike Trials we have boated 30 pike on lures and as the water cools, I think the big fish will feed harder and the fishing could get even better! Most anglers are anchoring and fishing deadbaits with limited success as I feel the pike are not really hungry yet due to the availability of the baitfish. After the success of the BLAC Lure Final, where over 250 pike were taken on lures in a day, I am amazed that more anglers havent taken to drifting Chew using lures, rather than sitting it out over 4 deads waiting for the pike to strike? Still, I suppose it must come down to a lack of confidence in lure fishing or simply the misguided belief that big Chew pike only take deadbaits. I expect I will also fish deads when it gets too cold to feel my fingers, but until then, I will be casting those lures and trying to cover as much of Chew's 1200 acres as possible! Although all the boats on Chew are sold out during mid week, there are still weekend flyfishing boats available for trout (or pike) up till and including Sunday 9th November. On days when the wind drops I have recently witnessed some excellent buzzer hatches and trout rising to them all day - particularly in the Stratford and Herriots area of the lake. Dry fly will be the method for these rising trout, with Hoppers, Bobs Bits and Carrot Flies being the best patterns by far. If the winds stop the trout from rising, then try larger fry imitating lures such as Minkies, Sparklers and the good old Humungous Lure. A DI3 is the best line to fish these fry patterns and anywhere across the lake is worth a try. However, with the masses of fry near the landing stages and cages, this has to be a hot spot. I have had some huge brownies chase my pike lures and also some cracking rainbows - even though they are too big for them to take effectively. There are also thousands of great perch near the cages and Sailing Club and fly is way better than lures to tempt them. Last season I had a day on the perch and caught so many I lost count. My best perch weighed 4:01 and my best double-up was a 3:11 on the point fly with a 3:12 on the dropper! Recently there have been some great bird sightings on Chew. An Ospreys has been present for several weeks as a visitor during it's migration to warmer climes. I have spotted it diving to take roach off the surface several times and it really is an exciting sight. Last week a Phalarope was present for a few days as was a juvenile Great Skua - I wish that more of those were present because the gulls are scared witless when it is around! I also saw a Peregrine chasing and bombing ducks on one day, while the Little Egrets are still around and there numbers seem to be growing each year. After a career with Bristol Water spanning 47 years, Bob Handford finally retired last week. There was a gathering of many anglers to wish Bob a long and happy retirement, with the BRFFA presenting him with a new fishing rod in recognition for all his dedicated and helpful service to anglers visiting the Bristol Waters over the years. Bob has been such a helpful person over the years and his presence will be missed. In the meantime, Bob's assistant Tony Donnelly will take up the reins and will do a great job. Tony has been assistant fisheries manager now for over 3 years and in that time has made some significant improvements to the fisheries. I am sure that Tony will fill Bob's boots perfectly and with him, the future of these famous fisheries will be assured.